The Bolivia-Chilean border was the first stop on my tour of the Uyuni Salt Flats– one of the highlights from my four-month trip in South America. During the 3-day, 2-night excursion, we drove in a 4×4 SUV through some of the most unique, surreal landscapes on earth… before concluding in the small, grungy town of Uyuni, a place I recommend spending as little time in as possible. Now six weeks into my trip and exhausted from changing hostels nine times in just over two weeks, I decided to pause in Sucre, the unexpectedly clean and wonderfully cheap “white city” to rest and reflect on everything I’d seen and done thus far. After 5 quiet days in Sucre, I was ready to move on to the sublimely chaotic La Paz. 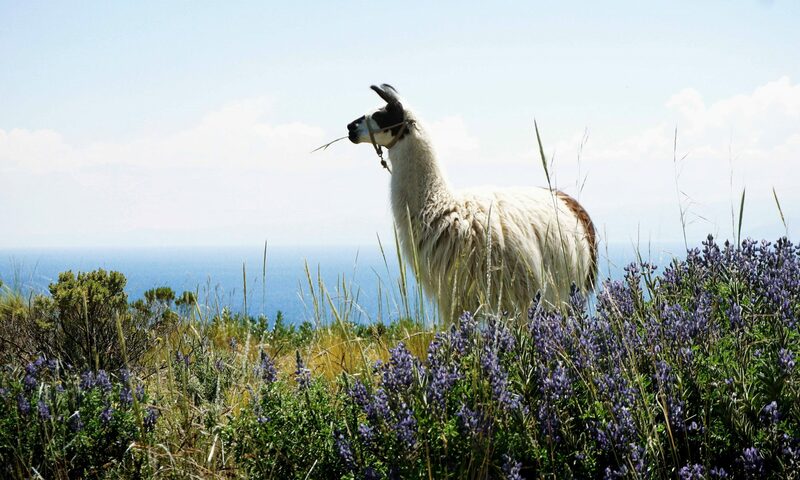 I spent a few days simply wandering the crowded streets chock-full of vendors selling everything from fresh produce and toilet paper to bras and underwear, before finding peace and tranquility once again on the shores of Lake Titicaca. I loved my time in Bolivia, but there were a couple things I wish I would have done differently. First of all, I regret not biking on Death Road. I made the common mistake of going way over-budget during the first few weeks of my trip. Normally costing around 350 Bolivianos ($50 USD), Death Road is a pricier excursion, and I decided to skip it to save money. But, I wish I would have been more budget conscious in Argentina and Chile instead. The other regret I have about my time in Bolivia was not going to Amboro National Park. Located in central Bolivia near Santa Cruz, it’s a little-known attraction in a country that remains relatively undiscovered itself. In fact, I didn’t hear about Amboro until I was already in Sucre. But, the people I met who went said it was spectacular. Given how beautiful the rest of the country is, I completely believe it. The US Department of State website gives Bolivia a level 1 out of 4 (4 being most dangerous) travel advisory rating, which means “exercise normal precautions” when visiting. In the Global Peace Index, which measures various safety attributes such as homicide rate, violent crime, terrorism, and internal and external conflict, Bolivia is ranked #94 out of 163. Not bad considering Thailand is ranked #113 and the United States is ranked even lower at #121!